Collectors from around the world raised their paddles to bid in hopes of going home with a piece of Elvis history at the “Auction at Graceland,” which took place at the theater at The Guest House at Graceland during the Elvis Birthday Celebration. The annual auction of rare and authentic Elvis Presley artifacts and memorabilia featured an impressive 271 lots on the grounds of Graceland. Bidders from all over the world participated on-site, by phone and online. Fans, music collectors and pop culture enthusiasts from around the world bid competitively for a chance to own a piece of Elvis memorabilia with all 271 lots expertly authenticated by the staff of Graceland Authenticated. All of the items in the auction were offered from third-party collectors and none of the items included in the auction came from the treasured Graceland Archives. The mansion and all artifacts in the Graceland Archives continue to be owned by Lisa Marie Presley and are not for sale. 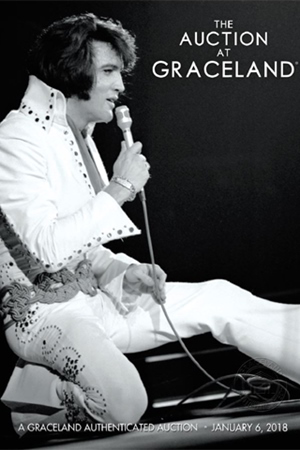 Graceland Authenticated sets a new standard for pop culture authentication and appraisal to ensure artifact accuracy and provide evaluations of privately-owned collections. Among the 271 items offered in the January 6 auction, notable items include: a Diamond and Platinum Ring Gifted to Linda Thompson for $27,500; a Globe-Shaped Free-Standing Wooden Bar from Elvis’ Beverly Hills Home which brought $22,500; Elvis’ 1922 Colt “Police Positive” .32 Caliber Revolver which sold for $20,000; an RIAA Gold Record Award for Elvis’ 1968 LP Elvis (The 1968 “Comeback TV Special") – Awarded in 1969 which sold for $17,500; a Leather Rocking Chair from the Jungle Room at Graceland which sold for $17,500; an RIAA Gold Record Award for Elvis’ 1977 Single “My Way” which sold for $13,750; a 1970’s Elvis Presley Oceanside Chief of Police Badge which sold for $8,125; numerous films, photos and original acetate recordings were also popular among bidders.